This is a simple spread. It is focused on one issue. It is not intended to give a past, present, and future. It just gives you several cards. Read them separately, as if you are reading words in a sentence. After you are sure you grasp the meaning of all the cards individually, then put them together, as if making a sentence, and see what they tell you as a group. After you shuffle the cards, clear your mind and listen for a number. Keep that number in mind, since it is how many cards you will be drawing. Spread the cards in an arch in front of you. Let your intuition guide your hand to cards in the arch. Pick the cards, one at a time, until you have as many as the number you sensed or heard earlier. Place them in a row within the arch, one by one, as you pick each one. They now form the Gateway to the Soul. You can place them face down or face up. If you place them face down, you can turn them all over at once, or one at a time and read each one before you turn over the next. For some strange reason, most people seem to usually hear odd numbers, and usually three or five. As a review: Shuffle the cards. Listen intuitively for a number. 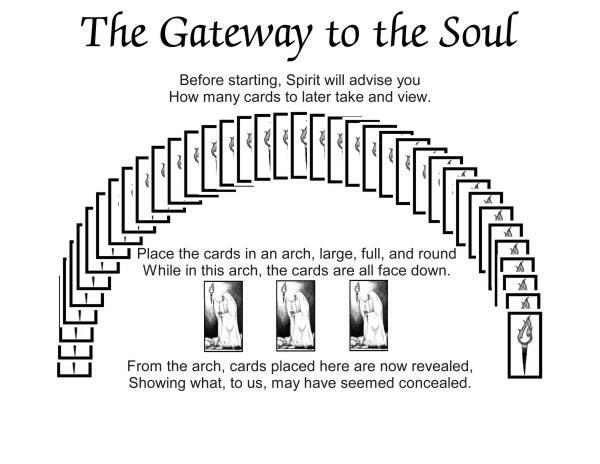 Spread the cards into an arch. Draw as many cards from the arch as the number you heard. Place them in a row under the arch. These cards are the message for you. An illustration with some directions (written in verse) is below. Click here to go to The Celtic Cross.